Complete the Florida Boating Course Online! 100% Online and State Approved! Boater Card and Certificate Included! Meet Your Florida State Boating Requirements! Easy, Online Course & Final Exam. Get Instant Downloadable Certificate Upon Completion. Start Boating While Waiting for Your Permanent Florida Boating Card. Florida Boating Safety Educational Requirements were updated January 1, 2010. This update requires boat operators who were born on or after January 1, 1988 to obtain a Florida Boating Safety Education Identification Card in order to operate a motorboat with ten horsepower or more. This Florida boating safety course meets the State of Florida's requirement for basic boater safety education. 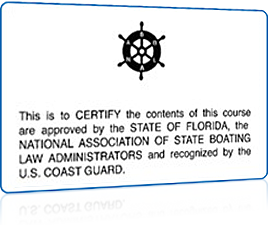 When you successfully complete the course and exam online, you will receive a course completion certificate by mail and we will automatically report your completion to the Florida Fish and Wildlife Conservation Commission for issuance of your Boater Safety Education I.D. Card if you are covered by Florida's mandatory boater education law. The state of Florida does not have a "boating license". 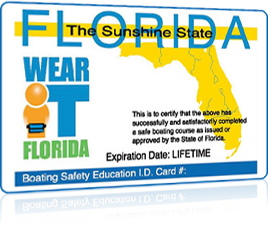 The FWC issued Boating Safety Identification Card is proof that you succesfully completed the online boating course. This card is valid for life. This course is approved by the National Association of State Boating Law Administrators (NASBLA) and is recognized by the United States Coast Guard. By successfully completing this approved basic boating safety education course you may qualify for reduced boat insurance premiums. Please contact your insurance company to see if you qualify for a reduction in your premiums based on your completion of this course. Those receiving boating citations from law enforcement may be required to take a safe boating course. However, this must be a classroom boater education course — The online course does not meet this requirement.